We started to do guided 4X4 Self Drive Safaris up to Botswana in 1997. We bought a Botswana registered company – with a Tourism Enterprise license – by the name of Destination Africa, and conducted safaris under the same name. 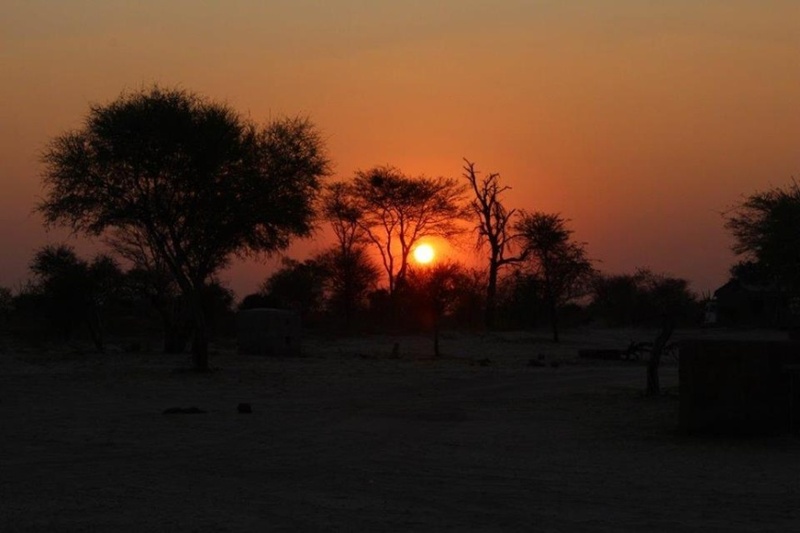 After a year or two, Destination Africa started to expand their safaris and itineraries to Zimbabwe and Zambia. It was always in the back of my mind to do a safari to the Serengeti in Tanzania, to go and witness the migration of the wildebeest. So when some of our clients started to make the same noises, I had to make some serious plans to get all the relevant information and knowledge on the table. Being a professional tour operator in Africa for a couple of years, we “thought” that we had all the necessary experience of travelling in Africa, but realized that we lacked seriously in specialized knowledge of travelling via Malawi to Tanzania in East Africa. We also did not have enough time on hand or the monetary recourses to conduct a reconnaissance trip before we go commercial. The only other way out was to tie up with somebody who has been to Tanzania by road from South Africa before and to obtain his or her services as consultant and assistant guide on this “breaking new ground” safari into the unknown. I was living in Polokwane by that time and after mentioning my dilemma to a good friend of mine, he introduced me to exactly the person that I was looking for. He drove up to the Serengeti the previous year and was also quite an experienced Africa traveller. The two of us literally spent hours and hours together looking at different maps and debating various routes and itineraries. By that time I already had a group of eight vehicles together for the expedition. After meeting with the group at Kyalami in Johannesburg, the itinerary was finalized and we could start to make reservations and finalize all arrangements. Early one morning in May 2003, the convoy of nine well prepared and fully rigged 4X4 vehicles left Mussina and headed for the Beitbridge border post with Zimbabwe. In that years the situation in Zimbabwe was relative peaceful and although fuel was a problem from time to time, it was quite safe to travel through the country. We went via Masvingo and Mutare to Casa Msika in Mozambique where we spent the first night. From there the route took us to Cahorra Bassa Dam. That was before the road was rebuilt and it was in a terrible state. The section up to Changara was really bad with pot holes and one had to drive next to the “road” for almost all the way. In the beginning years we had to stay two nights at Cahorra Bassa to do repairs on the vehicles after travelling that horrible potholes. The next morning it was off to Dedza border post with Malawi. The last 200 kilometers before the border was gravel and of such a nature, that speed was limited to not more than 50 kilometres per hour. The main roads in Malawi were always relative good and after a welcome two night break at Chitimba beach, we headed for Kasumulu border post with Tanzania. We were in for the shock of our lives. There were very little sign of a formal border post building. Containers were scattered all over the place and accommodated various departments from Customs to Immigration, Road Levy and 3rd Party Insurance. It was total chaos and nobody knew where to go first. There were guys all over driving you crazy in order to change US Dollars for Tanzania Shilling. Some of the people in the group were also done in properly by these “informal bankers”. After this ordeal, the convoy entered beautiful Tanzania. We all had a warm feeling of satisfaction….after dreaming about this adventure for many years and travelling through three African countries; we reached the country of our destination. The itinerary took us further via The Old Farm House, nearby Iringa, to Dar Es Salaam where we stayed at the Silver Sands Hotel on the north coast. The next morning we drove into the city where we left the vehicles in the safe keeping of the staff parking of the Royal Palm Hotel. They supplied us with an electricity cable from the hotel and we could plug in all our freezers in the vehicles for the duration of our stay on the island. After seeing the luxury of the Royal Palm, everybody wanted to know why we couldn’t stay there…….maybe something for the future! From there we were shuttled down to the Ferry Port where we boarded the SEAHORSE 2 for Stonetown harbour on Zanzibar Island. The name Zanzibar came from a combination of two Arabic words, “Zinj”, meaning black, and ‘barr’, being the Arabic word for land, the result meaning “Land of the Blacks”. After one night in Chavda Hotel in Stonetown we left for Nungwi Beach resort on the northern tip of the island. Nungwi is a small fishing village with the most beautiful beaches. We spend our days on the beach and went on a snorkelling trip by dhow to Mnemba Island. As all good things come to an end, we had to take the ferry back to the main land after three days to be re-united with our trusty vehicles. Then further north to Arusha where the itinerary took a very interesting new angle. The group split in two as I took 7 people to climb Mount Kilimanjaro while the other guide took the rest of the group to Tsavo East, Tsavo West and Malindi Beach in Kenya before we re-united in Arusha after six days. We stayed over for two nights at Maserani Snake Park for a rest day. In 2003 Arusha was much smaller than today and just got a new Shoprite complex. The ladies did some shopping while some of the men took their vehicles to Henry at the BP Station for a very professional oil change. Ten years ago many diesel engines had to be serviced after 5000 and 7500 kilometers. Everything sorted and stocked to capacity, the convoy left for Ngorongoro Crater on the scenic route via Karatu. Now it is important to know that there are some things in life that one only does once. One of them is definitely to camp at Simba Camp on the rim of the crater in winter time. It was freezing cold and soaking wet and the ablution facilities in that years were virtually non existing. The next day the convoy of nine private South African registered vehicles took the descend road down into the crater. It was quite a rare sight because very seldom private cars go down into the crater and all the local tour guides stared in disbelieve at us. The next day the group reached the “highlight” of their safari as they reached Naabi Hill where the main entrance gate to the Serengeti is situated. If you think back of the road from Ngorongoro to Seronera, you will probably recall memories of the worst road you ever travelled. It reminds me of the sigh board that use to be at the turn off to Kosi Bay that read: “Remove all dentures and fasten your bra straps”. That specific piece of road is still very bad, but in those years it was really horrible. Apart from some flat tyres, two broken shock absorbers and a couple of lost fillings on some peoples teeth, we reached Seronera in pretty good shape. It was the beginning of June and we found the huge migrating herds of white bearded wildebeest in the Western Corridor in the Kirawira area. Although this was our first safari to Serengeti we managed to gather enough information to found the hot spots of the migration…but little did we know, that as our knowledge increases as we become more experienced, the better the sightings will become over the years. On out way back we camped at a very nice little community camp called Melela Camp. It was just outside the Mikumi National Park but unfortunately burned down in 2005 and became unfit for use. From there further south to the lovely Utengule Coffee Estate outside Mbeya. That was our final night in Tanzania before crossing into Zambia. The Nakonde border post was definitely the worse on the entire safari. Ten years later it looks exactly the same and is still as inefficient as in 2003. We spent two nights at Kapishya Hot springs before going via Livingstone to Mutemwa Lodge on the Zambezi River. The owner was friends with some of the people in our group and he invited us for some tiger fishing on our way back to South Africa. In 2003 the road from Kazangula to Sesheke was still gravel, very little travelled and with no bridge over the Zambezi. There was an old dilapidated ferry which was more broken down than in working order. With our luck it was not operating and we had to turn back to Kazangula. We arrived one day late at Mutemwa but still had two well deserved rest days doing tiger fishing. An extremely “border crossing fit group” crossed the Chobe flood plains at Ngoma into Botswana in a record breaking time and we all drove through to Kasane where we camped for the next two nights on the banks of the Chobe river. We did a morning game drive in true Africa style with open Land Cruisers in the Chobe National Park and a three hour sunset game cruise on the Chobe River………another highlight! This first East Africa adventure in 2003 ended with a seated dinner in the open air restaurant of Chobe Safari Lodge. That was before the entire lodge was rebuilt and all the tables were arranged around the small kidney shaped pool. The spirits were high and although every body missed their loved ones after a full month on the road, and wanted to get home as soon as possible, there was a strong feeling of camaraderie amongst the group and longstanding relationships were formed. April is the beginning of the annual wildebeest migration in the Serengeti and thousands of Wildebeest gather on the Naabi plains each year. It is the end of the rainy season and the plains are lush, green and covered with yellow and purple flowers. It is also the end of the calving season and every cow is walking with a calf. This month is called “The birth of Life”. We learned over the years where to find the wildebeest herds, the predators are plentiful and the sightings excellent! The second annual safari takes place in the beginning of August in the far north of the Serengeti. This is the time of year when the migrating herds reaches the Mara River and have to cross the Mara with its flotillas of hungry crocodiles. Their destination…. the Masai Mara in Kenya. Early 2006, I was approached by a German gentleman who dreamed of putting an epic, once in a live time safari together to the former “German East Africa”. The plan was to drive with 5 vehicles to Uganda and back all along the East Africa coastline via Dar Es Salaam and Maputo to South Africa. Apart from the fact that it would take very careful and detailed planning from us as it was also a first for me, we had to fit in three East Africa safaris into that one year. The party would consist of five German surnames and when putting the first two letters of each surname together it would spell the name LOLUBAWETU and that was exactly what we called this 17,000 kilometers (over seven and a half weeks) safari to north of the equator and back to South Africa. From Seronera we travelled through the Western Corridor via Kiriwira and Ndabaka Gate to Mwanza, which is also Tanzania’s second most populous city. Mwanza is situated on Lake Victoria which was named after Queen Victoria of the United Kingdom, by John Hanning Speke, the first European to discover this lake. With a surface area of 68,800 sq km, Lake Victoria is Africa’s largest lake. In addition, it’s the largest tropical lake in the world, and the planet’s second largest freshwater lake. Only North America’s Lake Superior is larger. After finding our campsite on the water edge, I started to arrange the loading of the vehicles on the ship, also called “The Victoria”. We made use of the Shipping Company, Marine Services, situated at the harbour in Mwanza. They run a bi-weekly ferry service from Mwanza to Bukoba on the north western shore of Lake Victoria. Crossing the lake with the Victoria was an adventure in it’s own right. We started to load the vehicles and four off road caravans at nine’o clock that night. The cargo varies from vehicles, livestock, tomatoes, provisions, Chinese motorcycles, coffins and lots and lots of passengers. We were booked into five, first class cabins on the top floor. Each cabin had two bunk beds that reminded very much of the cope compartments that one got in the old railway coaches. After a fourteen hour journey we disembarked and unloaded the vehicles at Bukoba. We crossed the border into Uganda at Nshongezi before heading for Mbarara where we spend our first night in Uganda. Uganda is a beautiful and peaceful country. Back in 1909 Sir Winston Churchill called Uganda “the Pearl of Africa”. The next morning we were off to the Queen Elizabeth National Park. We also visited Lake George, Lake Edward and the Kazinga Channel, connecting the two lakes. Then south again to the Bwindi Impenetrable National Park. We stayed over for three nights in a small backpackers lodge at the entrance gate of the park. That gave us two days for gorilla trekking. We paid $500 per person per day, but it was absolutely worth our while, an unforgettable, life-changing experience – a unique adventure in the heart of Africa’s most spectacular rainforests. Gorilla trekking safaris trek deep into the rainforest in search of the magnificent mountain gorillas. The gorilla trek can take anything from 15 minutes to 8 hours, depending on where the gorillas are located. No matter how short or long the trek, spending time in the company of a gorilla family guarantees that the journey will be extraordinary. On day one we got the first family not more than an hours walk prom the starting point. The next day we had to work a bit harder. Then we left via Kabale for Kampala. We drove through a stretch of beautiful landscape, also defined as the “Switzerland of Africa”: mountains, lakes, hills with cultivated terraces, tropical rainforest and bamboo forest. We had lunch at the Equator and had the opportunity for a photo shoot and buying some souvenirs. Then into Kenya. We spend two nights in Narok while visiting the Masai Mara, one night in the Pan African Hotel in Nairobi and then south to the Amboselli National Park. Set against the magnificent backdrop of Africa’s highest mountain, the glittering Mount Kilimanjaro, the campsite enjoys a uniquely privileged position at the heart of this world-famous national park. From Amboselli we entered Tanzania again at the Namanga Border Post and drove via Arusha back on our tracks to Dar Es Salaam. where we stayed over in the five star Movenpick Royal Palm Hotel. After all the camping and more “primitive” facilities in Uganda and Kenya, this was exactly what the doctor ordered to chill the group out and to prepare them for the journey down south…again on a road less travelled. We had time to do some shopping, washing and minor maintenance on equipment. After two days, we were on the road again. This time from Dar Es Salaam in a southerly direction…the aim was to see how close we could travel to the coast line all the way down to Maputo. The first stretch was to Kilwa Masoka where we stayed over for two nights in The Kilwa Sea View Resort situated on top of a cliff overlooking the Kilwa Masoko bay. Kilwa Masoko sprang up as the market town associated with the thriving Arab city-state of Kilwa Kisiwani on the large island surrounded by the Kilwa Bay. Over time the city-state collapsed and the brunt of the population moved off the island to Kilwa Masoko. Kilwa Kivinji is an pleasant Swahili town smaller and politically less important than Kilwa Masoko about 20km away. Today Kilwa Masoko is the capital of the Kilwa district in the Lindi region. Most visitors stay in Kilwa Masoko and use it as a base for visiting the other two Kilwas. 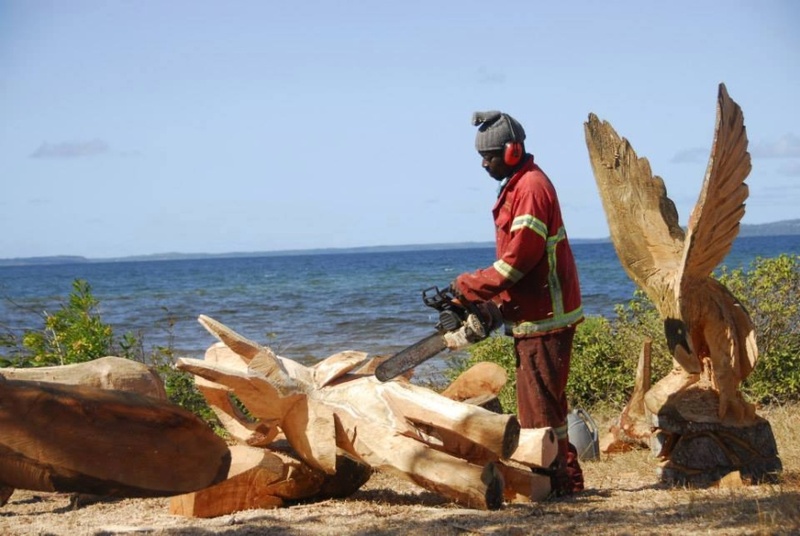 Then it became time to move on…from Kilwa Masoko to Mtwara. The old Africa story…. 245 kilometers of dirt road on the map…ten hours on the road. It was late September and the beginning of the rainy season. Some parts of the road got flooded; it was still passable but added significantly to the journey time. Every now and then the big busses got bogged down on the inclines and blocked the entire road. Mtwara was designed to be a major town and exporter of ground nuts, however when the ground nut scheme collapsed before it was started, the town never really finished being built. We stayed over at Msemo, also known as Southern Cross. This is the main tourist place in town; it’s right on the sea front and offers wonderful views over Mikindani bay. Late afternoon I drove down to the Mwambo border post with Mozambique to get more information about our river crossing over the Rio Ruvuma by pontoon the next morning. It was only the beginning of the rainy season and the ferry was stucked on a sandbank in the middle of the river. They informed me that this time of year the pontoon is only operational with springtide, when enough water is coming in through the mouth from the sea, to lift the pontoon off the sand. Luckily, springtide was only four days away. We booked in into the chalets at Southern Cross and enjoyed the unplanned next four days fishing and chilling out on the beach. On D-day the ferryman came to call us down to the pontoon. There was enough water and the pontoon was ready and waiting for us to load the vehicles, one at a time. On the Mozambican side, we drove through beautiful mangrove swamps before being stopped at a very dilapidated boom at the small border post at Namuiranga. The immigration officer was sitting in his office – constructed from rusted corrugated iron and weaved reed mats – listening to some Portuguese radio station. There were nobody to give us the customs stamp and we had to wait more than an hour for the dude in a camouflaged uniform to pitch up. Today the pontoon does not exist anymore and the border post is closed. The Chinese, together with some South African contractors, are building a new tar road that will connect Dar Es Salaam with Mozambique. Beyond Masasi the road is newly paved for some 60km towards Tunduru and the Unity Bridge which provides a new crossing point to Mozambique. Our journey further south took us via Palma, the picturesque Mocimboa de Praia and Pemba, to Ihla de Mozambique, our next two night stop over. We spoiled ourselves by checking in at the Hotel Escondidinho, near the Marinha. a tastefully renovated double storey building with 10 rooms, swimming pool and restaurant. Ilha de Mozambique (Mozambique Island) is an island in the Nampula Province in Northern Mozambique with a historical heritage that’s unmatched in the rest of Mozambique, and indeed the rest of Africa. It was the capital of Mozambique for nearly four centuries under Portuguese colonization before the move to Lourenco Marques (now Maputo), and had been used as a major base for the Arab traders since around the 8th century, long before the arrival of the Portuguese. It’s a UNESCO World Heritage Site. The tiny island is only 3km long and very narrow. It’s connected by a concrete bridge with the mainland and is said to be crowded by 16000 inhabitants, most of them living in bustling Macuti Town. Stone Town occupies the northern half of the island and is much grander than Macuti town in the south, but both are UNESCO listed because of their significant architecture and cultural tradition. After two very special days, it was back to the main land and south to Quelimane where we stayed over for one night. Quelimane is a seaport in Mozambique, the administrative capital of the Zambezia Province and the province’s largest city, and stands 25 km from the mouth of the Rio dos Bons Sinais (or “River of the Good Signs”). The river was named when Vasco da Gama, on his way to India, reached it and saw “good signs” that he was on the right path. After almost eight weeks and 17,000 kilometers through Africa, we were now approaching the end of our safari. We drove in a south-westerly direction towards Caia where we had to cross the Zambezi with the famous – sometimes it works, but most of the time not – old 22 ton ferry. That was also, like many of our other experiences, the end of an era! In March 2007, construction commenced on what would be the longest road bridge to span the Zambezi. The bridge over the Zambezi was officially opened on August 1, 2009, and with some controversy, was named after the current president of Mozambique, Armando Emilio Guebuza. With a length of 2376 metres and width of 16 m it will be longer than the bridges at Tete and Katima Mulilo, exceeded only by the Dona Ana Bridge, which has been restored as a rail only bridge. The anticipated bridge was crucial in linking the Sofala Province and the Zambezia Province. The Caia bridge cost an estimated US$80 million. 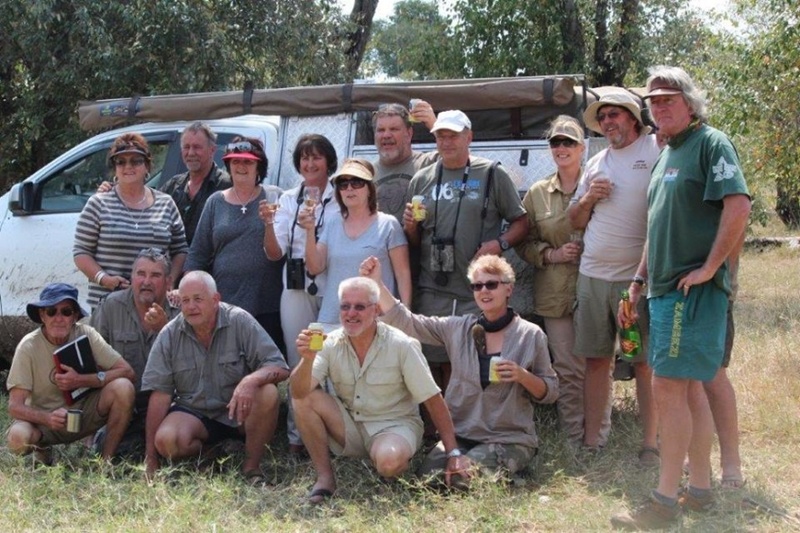 The end point of this epic safari was at the Gorongoza National park. As some of them knew the area quite well, the German contingent would go down south to Maputo on their own and I returned so South Africa via Zimbabwe to prepare for our annual safari to Liuwa Plains in Western Zambia. We are running our Tanzania safaris for the past five years on very much the same itinerary. I think we have sorted out the routes, places of interest, and the best overnight facilities over the years. As we are always open to new ideas and overnight places, we regularly look at alternatives and are sometimes forced to deviate slightly off the itinerary. Due to the never ending chaos at Beitbridge we commence our East Africa safaris at Africa House (our 4 Star Guesthouse) in Centurion. From there we enter Mozambique at Komatipoort and spend the first night at Casa Lisa, some 50 kilometers north of Maputo. Then up to Vilanculos where we spend two nights overlooking the Bazaruto Archipelago and do a boat and snorkelling trip to Bazaruto Island and Two Mile Reef. The next night will be at the Cahorra Bassa Dam and then we are back on the old tried and tested route. On our August safari we include Zanzibar Island but we now stay one night in Stone Town and two nights on the East Coast, and yes…we are staying in the Royal Palm Hotel in Dar Es Salaam. It is now taken over by the Serena Group of Hotels and is nowadays called the Serena Dar Es Salaam, a fantastic hotel in true East Africa 5 Star Style. Over the years we managed to build up good relations with the Park Warden and Tourism Warden in the Serengeti. We managed to book campsites on the bank of the Mara River and we learned how to find the river crossings of the Wildebeest. We do not camp at Simba Camp on the crater rim at Ngorongoro anymore. We stay in the campsite at Kudu Lodge in Karatu for two nights and we make use of chartered Land Cruisers to take us down into the Crater. By doing this, we do not have to take down camp and one also experience much more of the Crater. It also works out less expensive then driving your own vehicle down the Crater. And yes…after 10 years we still make use of Henry at the BP Station for all the repair and maintenance on the vehicles! Due to demand, Explore Africa also started some years ago to do Fly Inn Safaris to the Serengeti and climbing Mt. Kilimanjaro. There are so many people that cannot afford to drive up to Tanzania and to be away from the work place for such a long period. We tailor made fly in packages through our sister company, Explore Plus, to accommodate clients specific needs. We offer flexibility throughout the planning progress including choosing preferred dates of travel, number of days that clients are travelling for and preferred standard of accommodation. We make use of hired Land Cruisers in Ngorongoro and the Serengeti and can include or exclude a visit to Zanzibar Island. We specialize in group climbs to Kilimanjaro and also tailor made the event according to the clients needs in terms of accommodation, duration and the degree of difficulty of the climb. Here we can also include a visit to Zanzibar Island. We were fortunate to be involved in a team building exercise during the amalgamation of the North West University and took Prof. Theuns Eloff (Chancellor), Prof. Anette Combrink (Rector) and their management team up Kilimanjaro and all the way to Uhuru Peak. Interested parties can contact Avril Malan at Avril@ramsaymedia.co.za or on +27 21 530 3186.